Holy Week is the most sacred time in the life of the Church, when we commemorate the events of Jesus’ final week leading to his death and resurrection. In fact, almost half of Mark’s gospel is taken up with telling the story of this single week, as if to emphasize the monumental importance of those seven days. It begins with his entry into Jerusalem, and includes his final meal with his friends, washing their feet, praying fervently in Gethsemane, betrayal by Judas, the strange trial before Pilate, and his execution. 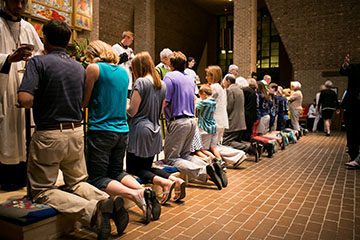 Christians believe that every aspect of the week is sacred, and especially so in the Paschal Triduum (the three days of Maundy Thursday, Good Friday, and Holy Saturday, culminating in the Great Vigil of Easter). For the faithful, worship in Holy Week is more important than anything else we could do, and it takes precedent over all other activities: work, school, sports, or recreation. But we do not worship in Holy Week out of duty or obligation, but because we know that if we walk this way once more with Jesus, the way of the cross, we will find it none other than the way of life and peace. And come Easter Day, we will rise to greet the morning as though it were the dawn of eternity, for God has stopped at nothing to show us his love and to be with us forever. In the service listings below *denotes childcare is provided and + denotes incense is used. 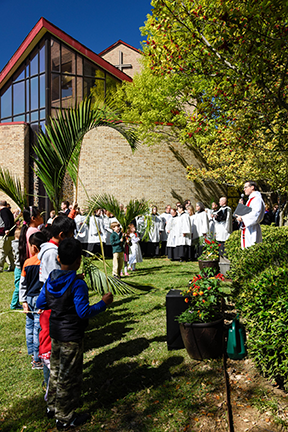 Saturday, April 13 – 5:30 p.m.
Sunday, April 14 – 9:00 a.m. and 11:15 a.m.
Palm Sunday begins our commemoration of the events of Holy Week. All four gospels depict Jesus entering the city of Jerusalem atop a humble donkey, amidst the fanfare of cheering crowds. Many of them shouted “Hosanna,” (literally, “Save us!”) and laid cloaks and palm branches in his path, a traditional response to the procession of royalty. 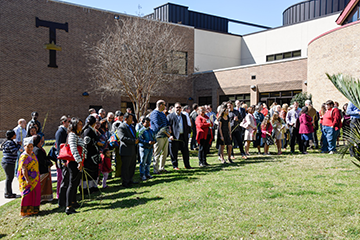 The service begins in joy, as we bless palm fronds and wave them jubilantly in the air. They are symbols of Jesus’ final entrance into Jerusalem, and may be taken home and kept until Shrove Tuesday (2020), when they will be burned to create the ashes for next year’s Ash Wednesday. 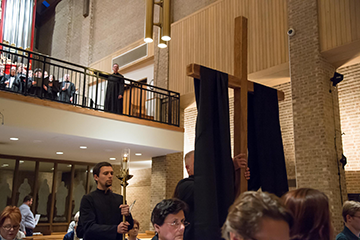 The mood of the service quickly changes from joy to sorrow, as the central element in the Liturgy of the Word is the reading of St. Luke’s Passion. In recognition of the ways that we reject and deny Christ, the congregation plays the role of the mob (“Crucify him!”), humbling us and challenging any notions of false pride or piety. Monday, April 15 – 7:00 p.m. | Tuesday, April 16 – 7:00 p.m. | Wednesday, April 17 – 12:00 p.m.
Join us as we gather at Christ’s table in the days leading up to the crucifixion. 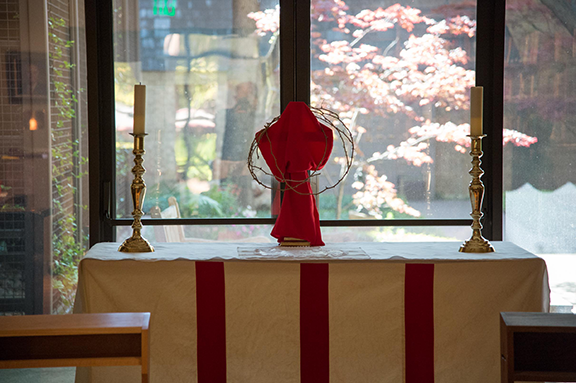 The Office of Tenebrae (meaning “shadows”) combines elements from the ancient monastic night and early morning services (Matins and Lauds) of the last three days of Holy Week. 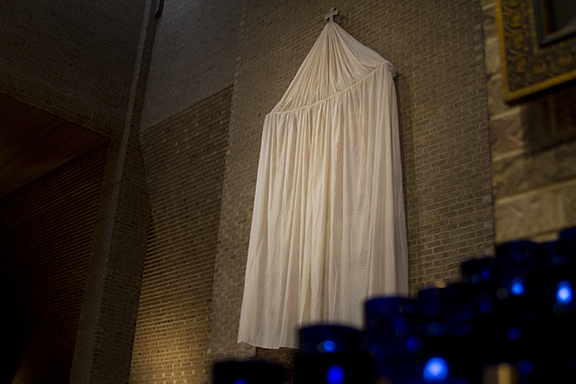 Each of the “nocturns” indicates a portion of the service that derives from one evening, and consists of psalmody, readings, and short passages from Scripture (responsories). The psalmody is chanted, led by scholas from the Transfiguration choir, honoring the monastic tradition of singing the psalms. 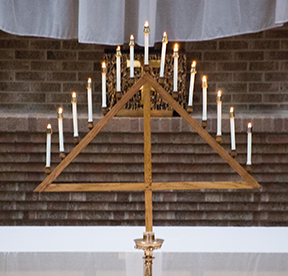 One of the most conspicuous features of the service is the gradual extinguishing of candles and other lights in the church until only a single candle, considered a symbol of our Lord, remains. Toward the end of the service this candle is hidden, typifying the apparent victory of the forces of evil. 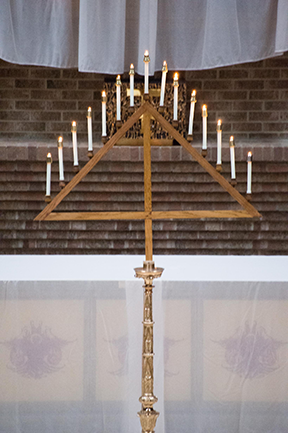 At the very end, a loud noise is made, symbolizing the earthquake at the time of the resurrection (Matthew 28:2), the hidden candle is restored to its place, and by its light all depart in silence. Maundy Thursday begins the arc of the Triduum, the three holy days of Christ’s Passion that concludes on Easter Day. The service begins in joy, as we remember the Passover meal established by God with the Israelites on the night of their deliverance from Egypt, and later shared by Jesus and his disciples on their final night together. We also remember Jesus’ giving of a new commandment: to love one another as he has loved us (“Maundy” is from the Latin mandatum, “command”). But the mood of the liturgy quickly changes and takes on the darkness that permeates the rest of the Passion. 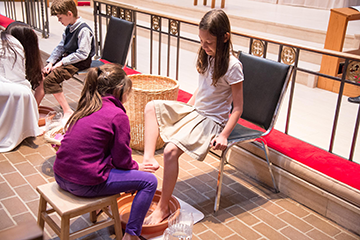 A centerpiece of the liturgy is the act of footwashing, when we will follow Jesus’ example, take on the role of humble servant, and wash one another’s feet. The sanctuary is then prepared for the solemnity of Good Friday in an ancient ritual called the Stripping of the Altar. All holy objects are removed from the sanctuary, leaving it utterly bare. The consecrated bread and wine of the Sacrament are transferred to an Altar of Repose (located in the Library), serving as a spiritual reminder of the time that Jesus spent alone in the Garden of Gethsemane the night before his death. 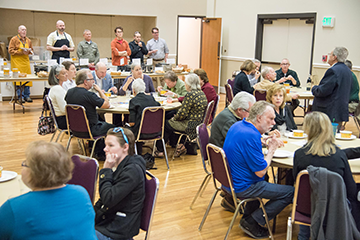 The Open Door Fellowship hosts a soup supper on Maundy Thursday from 5:00 – 7:00 p.m. in Roper Hall. Admission is $5.00 per person or $15.00 for a family. All proceeds will go to Youth First, a Dallas organization that serves LGBT youth in the Dallas area. The consecrated bread and wine of the Sacrament are transferred to an Altar of Repose (located in the Library), serving as a spiritual reminder of the time that Jesus spent alone in the Garden of Gethsemane the night before his death. 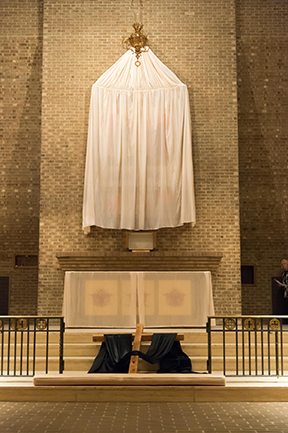 Parishioners can sign up to spend an hour in prayer sitting vigil with the Blessed Sacrament after it is borne from the church on Maundy Thursday until noon on Good Friday, or you can show up to any of the listed services above throughout the night. Stations of the Cross – 2:30 p.m.
Good Friday commemorates the passion and death of Jesus. In keeping with ancient tradition, we pray the Solemn Collects. In these prayers, we pray for nearly everything: for our own sins and redemption, for followers of Christ around the world, and for those who do not know God. On this day, we also venerate a plain wooden cross. This cross gives us a glimpse of the device used to crucify Jesus, but it also allows us to contemplate our own need to daily die to sin and to rise to new life. 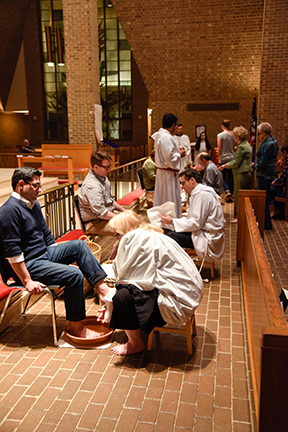 At our noon worship we share the Mass of the Pre-Sanctified, consuming all the remaining consecrated bread and wine from Maundy Thursday (note: this will occur only at the noon service). In keeping with ancient tradition, this is not a full celebration of the Eucharist, but a humble and quiet reception of communion on a day when we remember Christ’s death. No consecrated elements remain in the church following the noon service to underscore the feeling of absence and loss. While Good Friday is a solemn day, it is not a sad day. We should not pretend that we do not know the end of the story. Yes, Jesus dies, but from his death God makes possible the deliverance of all from death. Therefore, we depart the church in silence, as our Triduum liturgy is not yet over. 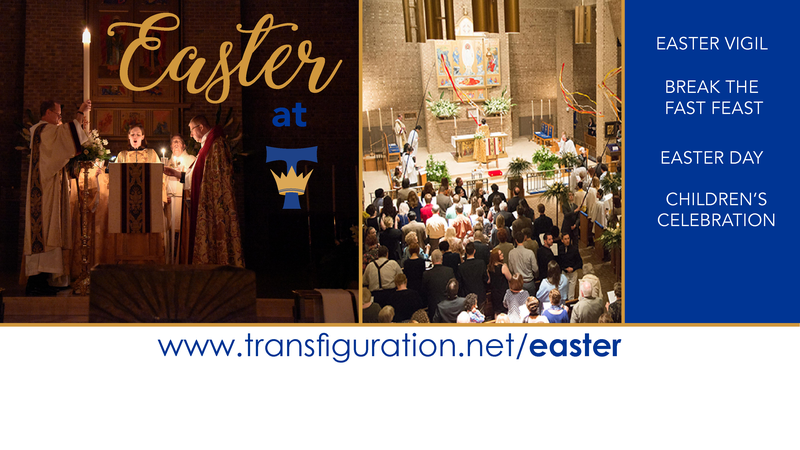 Join us for an early morning liturgy on the dawning of Holy Saturday. Our week culminates in a celebration of our resurrected Lord. Read more about Easter here.